Pure Lean Hydrolysed Whey offers up a unique formulation that is specifically designed to help stimulate the muscle building pathway. 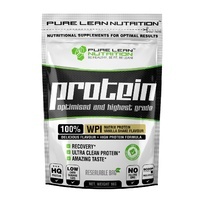 If you are looking for an ultra premium whey protein powder that delivers on muscle building, then Pure Lean Hydrolysed Whey is the supplement for you. Designed for serious athletes who want to stack on lean muscle and burn through body fat, Pure Lean Hydrolysed Whey delivers only hydrolysed whey protein for a superior, ultra-fast absorbing protein powder. Essentially, hydrolysed whey protein is whey protein that has undergone special processing to break apart the protein into highly desirable peptide fragments that get absorbed faster, and get to work right away to stimulate protein synthesis, increase cell volume and support muscle recovery! 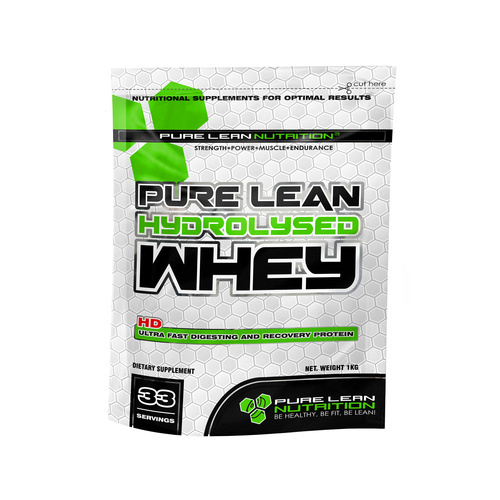 And unlike other hydrolysed proteins, Pure Lean Hydrolysed Whey delivers 15% hydrolysed protein allowing for a super high concentration of Branched Chain Amino Acids and Glutamine. BCAA’s are fundamental to stimulating muscle growth by igniting protein synthesis at the cellular level, while glutamine helps aid in muscle recovery, cell volume and maintaining muscle mass while training! During exercise, there is an increase in oxidation of the BCAAs, which signals to the body to stop protein synthesis in the muscles. The BCAAs including Leucine, Isoleucine and Valine are used up to maintain energy and make glucose, and even after a workout, oxidation and breakdown of muscle in the form of amino acids will continue until the right nutrition is received. In order to halt muscle catabolism, consumption of the essential proteins, including BCAAs before or after exercise can reduce protein breakdown, increase protein synthesis, and stimulate the release of insulin, the anabolic hormone responsible with building various energy molecules in the body and can ultimately prevent the breakdown of muscle following a hard workout. Several studies suggest that BCAAs can help delay fatigue and the onset of muscle soreness, as well as the markers of muscle damage associated with intense exercise. Leucine may be considered one of the most influential BCAAs when it comes to muscle building because it is a key regulator in skeletal muscle protein synthesis. As previously stated, exercise causes muscle protein turnover, which is when the rate at which protein degradation or muscle breakdown increases and the rate at which skeletal muscle protein synthesis decreases – essentially resulting in catabolism of muscle mass. It has been shown that Leucine activates a major complex in the anabolic pathway called the mammalian target of rapamycin (mTOR). Think of mTOR as the amino acid sensor of the cell which is triggered by Leucine concentrations. Decreasing Leucine signals to mTOR that there is not enough dietary protein present to synthesize new skeletal muscle protein and it is deactivated. As Leucine concentrations increase, it signals to mTOR that there is sufficient dietary protein to synthesize new skeletal muscle protein and mTOR is activated. Researchers believe that Leucine’s protein-sparing effect decreases the rate of protein breakdown and further stimulates protein synthesis. It has been proposed that in order for protein balance to become positive post workout, dietary protein, specifically BCAAs and Leucine, must be consumed, otherwise protein balance may remain negative! Pure Lean Hydrolysed Whey puts a stop to muscle catabolism and delivers on results, providing a high concentration of the essential BCAAs needed to elicit muscle building and speed recovery! This protein is designed for maximum muscle building, Pure Lean Hydrolysed Whey is formulated perfectly for before and immediately after workouts when your muscles benefit most from an ultra fast acting and rapidly absorbing protein! 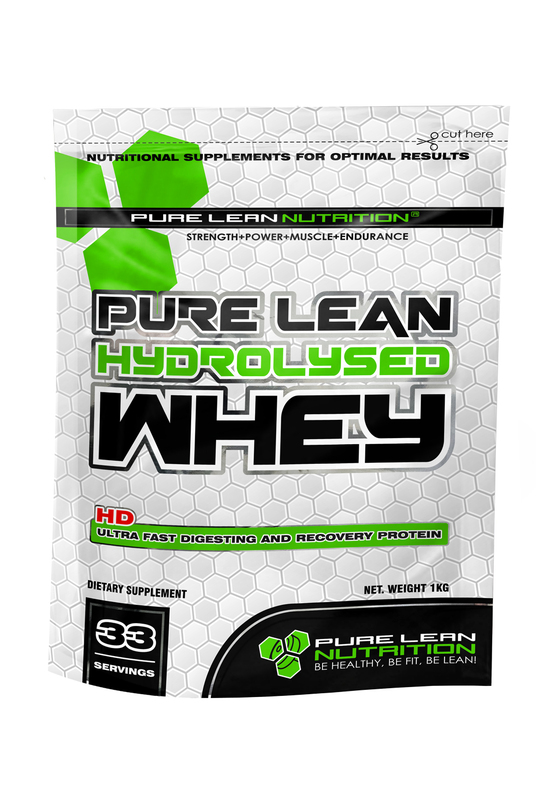 What is Pure Lean Hydrolysed Whey? Pure Lean Hydrolysed Whey is hydrolysed whey protein that is prepared using a special enzymatic process to partially hydrolyse regular whey protein, into smaller fragments called peptides. 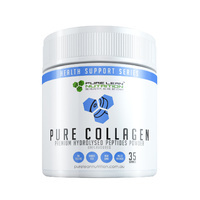 This breakdown process allows for faster absorption and faster delivery into the muscles stimulating protein synthesis or muscle building, while at the same time increasing cell volume and maintaining hard-earned muscle. Pure Lean Hydrolysed Whey, is unlike other hydrolysed proteins at 1 – 2%, providing a high concentration of 15% hydrolysed protein containing select micro-fractions and protein peptides. How does Pure Lean Hydrolysed Whey build muscle? 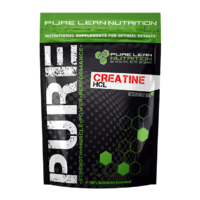 Pure Lean Hydrolysed Whey offers up a unique formulation that is specifically designed to help stimulate the muscle building pathway. 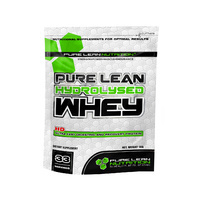 Pure Lean Hydrolysed Whey provides a high percentage of Branched Chain Amino Acids, specifically Leucine. This amino acid is a key driver in muscle protein synthesis. As Leucine concentrations in the muscle increase, it turns on the complex mTOR and once this complex is activated it stimulates protein synthesis or muscle building. As you train, the body relies on amino acids to fuel your workout, as you continue to burn through this source of energy, amino acid concentrations decline turning off muscle building, and causing the reverse - muscle breakdown to occur. 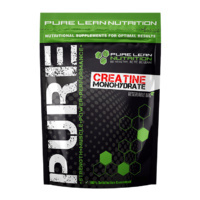 To avoid muscle catabolism, be sure to supplement your nutrition plan with Pure Lean Hydrolysed Whey to maintain a positive balance of amino acids within the muscle cells, and keep the body in a constant state of muscle building! What makes Pure Lean Hydrolysed Whey better than regular whey protein? 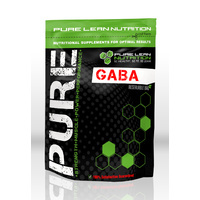 Unlike regular whey protein powder, Pure Lean Hydrolysed Whey is superior in quality and absorption rate. The ultra-filtration process results in only the finest and purest micronized protein leaving little else but high quality protein. Pure Lean Hydrolysed Whey is a not only a pure protein, but is superior in absorption too, providing only hydrolysed whey protein, which is partially digested smaller fragments of protein called peptides. This process yields not only a super fast absorbing protein but also a high concentration of muscle building Branched Chain Amino Acids, and cell volumizing Glutamine. BCAA’s are fundamental to stimulating muscle growth by igniting protein synthesis at the cellular level, while glutamine helps aid in muscle recovery, cell volume and maintaining muscle mass while training! Who is Pure Lean Hydrolysed Whey designed for? Pure Lean Hydrolysed Whey is designed for those athletes who are serious about muscle building. Pure Lean Hydrolysed Wheyis perfectly formulated for bodybuilders and physique athletes who want to build and maintain muscle, and are serious about their results. Pure Lean Hydrolysed Whey acts fast to provide high quality 100% pure hydrolysed whey protein that triggers protein synthesis and sustains a positive protein balance in the muscles to maintain hard earned muscle. Pure Lean Hydrolysed Whey's ultra-filtration process also results in removal of excess carbohydrates, lactose and cholesterol and fats, resulting in a pure and superior absorption that does not cause bloating or does not taste bitter. * Maximum Muscle Builder stimulates protein synthesis and activates the anabolic muscle building pathway mTOR by providing high concentrations of leucine and supportive BCAAs. * Stimulates Muscle Growth and Recovery by providing a fast absorbing protein that gets delivered right to muscle cells to stimulate the growth and recovery process. * Exceptionally Pure Lean Hydrolysed Whey is ultra-filtered for only the finest and purest micronized protein. * Helps Maintain Cell Volume provides a high concentration of BCAAs and glutamine that keep muscle cells full and pumped during workouts. * Ultra Fast Acting and Rapidly Absorbing exceptionally pure hydrolysed whey protein allows for a superior absorption directly into hard working muscles where it can drive muscle building and the recovery process. * High in BCAAs and Glutamine due to the hydrolyse process which yields a high concentration of muscle activating BCAAs and Glutamine, unlike regular whey protein. For maximum results blend 1 to 2 scoops of Pure Lean Hydrolysed Whey with 300 ml of water or milk. Timing is critical when it comes to muscle building, be sure to consume within 30 minutes before and after workouts to stimulate muscle activation during this highly receptive time when the muscles need it most! This protein powder can be used as pre-workout supplement to maintain a positive nitrogen balance while training. This ensures you provide your working muscles with the fuel they need to drive your workout. However, Pure Lean Hydrolysed Whey can also be used post-workout to kick start the recovery process, stimulating the muscle building pathways needed for growth and repair. Pure Lean Hydrolysed Whey is a perfect snack for in-between meals ensuring you are getting your protein needs fulfilled throughout the day.